Herald Sun has announced that Dave Hughes has quit The Footy Show to host a comedy based, eight episode for Network Ten. Just adding, that it’s described as an ‘agony uncle’ program, with Hughes leading a panel that “works through real people’s everyday issues”. It’s said to be an original format. As described it sounds like the old Beauty and the Beast. I don’t really like the title. But at least this is new content and with only 8 episodes this seems like it can go in the post celebrity tmeslot and within the pre Easter section of the schedule. I’m concerned about the proliferation of panel programs. This lo9ks like it’s being filmed at pyrmont again so more content coming out of the newly vacated studio. It’s a take on the phrase “Houston, we have a problem”. The show is similar to Hughesy’s segment on Rove Live not so long ago. I understand that. I was just saying I don’t like the title because putting his name jn there will instantly turn off people that don’t like him. Dave Hughes’ brand new show Hughesy, We Have a Problem brings together the biggest names in comedy and entertainment for a truly noble cause: to help the people of Australia get over life’s infuriating problems. Marking his return to TEN and WIN Network in a hosting role, beloved comedian Hughsey wants to take the problems experienced by everyday Australians – the big, small and the incredibly awkward – and turn them into working solutions. 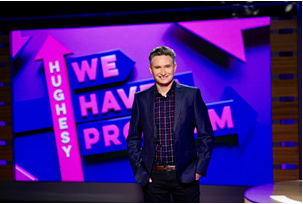 From how to handle infidelity to solving who gets to hold the television remote, there is no problem too big, small, funny or difficult for Hughesy and the team to tackle. Each episode, Hughsey is joined by four of Australia’s funniest comedians who offer searingly honest and hilarious insights as they help untangle the messiness of modern life. The show will be made by Screentime (Underbelly, The Secret Daughter etc.). Maybe we might see him make some appearances on The Project in 2018,or even a regular on The Sunday Project. I think this could be a sleeper smash hit. This is what’s going to pass for prime time entertainment in 2018? No thanks. Wonder if CBS has had any input into this. When I first read this, I instantly thought “not another panel show” and then remembered how polarising Hughesy can be in presenting roles. The premise of the show sounds alright, some new Australian content nevertheless and I guess it’s a short run and not another reality show. Yeah I agree I don’t love the name but I am glad ten are investing in some new content to begin the year. They will obviously have; Russel Coight and now this to launch the year. Hopefully they can invest in 2 more products to place in the 8:30 timeslot throughout the beginning of the year. I understand they probably won’t move NCIS (although they probably should). They need something for Monday nights at the start of the year and depending on how funny the panel is, this could be as big as big as Have You Been Paying Attention. I thought they would consider airing Russel Coight on a Monday considering both it and Have You Been Paying Attention are working dog shows. Yes but there are lots of weeks to fill before HYBPA returns later in the year and Ten have lots of other slots to fill without Fox shows. That is true. I keep thinking HYBPA returns after Easter but its more like early May. Better than Jamie’s Kitchen marathons. This sounds a bit similar to that Can of Worms show that Dicko/Chrissie Swan used to host. Cheap and cheerful, I’m surprised Ten haven’t tried more panel formats considering leaner times recently and the slow burning success that HYBPA has turned out to be. It’ll rate fine by Ten standards.